Colorful monster of a defensive end played for Cleveland Browns, Bears and New Orleans Saints. 1955 trade brought the 6'8" Atkins to Chicago. Was almost as legendary off the field as on it with his stories of drinking and carousing with his teammates. Eight-time pro bowler and three-time all-NFL player. 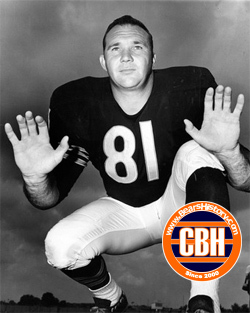 "There never was a better defensive end," said George Halas after Atkins' retirement, following his demand to be traded there in 1967. Elected to the Pro Football Hall of Fame in 1982.